A Wake County Public School System employee was arrested and charged with felony larceny. Arrest warrants say that on Monday Bradford sold a just-stolen iPhone X to ecoATM, a kiosk company that buys used cellphones for cash. Officials say that Bradford knew the phone, worth $1,000, was recently stolen. The phone was sold to ecoATM for $320, according to the arrest warrant. According to charging documents, Bradford is being held on a $5,000 secured bond. Bradford apparently works as an “assistant cashier for child nutrition services” and Ligon Road Middle School. 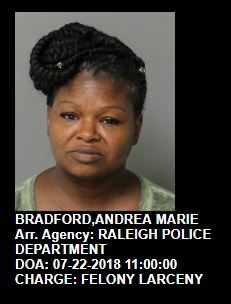 This entry was posted in CRIME, EDUCATION, Quiet Epidemic and tagged Andrea Marie Bradford, Quiet Epidemic, WCPSS. Bookmark the permalink. No background checks? When I taught in public schools in Florida, we were fingerprinted by the FBI. It isn’t just school shootings that endanger our children. These people have some misguided sense of entitlement.